Ananda opens with a clean citrus and a powdery, vanilla-ish floral that reminds me of heliotrope. It’s radiant a floral with a fruity glimmer. As it settles, it reminds me of peaches, nectarines and plums. I can almost feel the peach fuzz. In addition to the stone fruits, a powdery mimosa/cassie is very prominent. In this composition, the mimosa reminds me of milky, almond-y violets. It’s sweet, floral and delicate. The heart is a fruity-floral like the opening. It’s ripe stone fruits and powdery florals like mimosa, heliotrope and violets. The difference is that the citrus and citrus blossoms have fluttered away. Ananda’s dry-down is a powdery vanilla and musk with a whisper of candied almonds. Ananda reminds me a lot of Guerlain Champs Elysées before it was reformulated (before it was what it is now). Ananda is such a pretty, joyous, spring fragrance. It’s the sort of “frivolous fragrance” that I learned to love in adulthood. Give Ananda a try if you like mimosa or fruity-floral perfumes. Or perfumes like Guerlain Champs Elysées, Caron Fleur de Rocaille, Bond No. 9 Park Avenue, Bvlgari Pour Femme, Fendi Fan di Fendi, L’Artisan Mimosa Pour Moi and/or L’Occitane Arlésienne. The 3.4 oz retails for $235 at Osswald. Samples are also available for purchase. Victoria’s Final EauPINION – Summer fruits and mimosa. If you like late 80’s/early 90’s style of fruity-florals like Guerlain Champs Elysées, Caron Fleur de Rocaille or Lancôme Trésor, this is one to try. *Sample obtained by me. Product pic from Fragrantica (I think that is a Euro exclusive bottle, but I don’t know for sure). 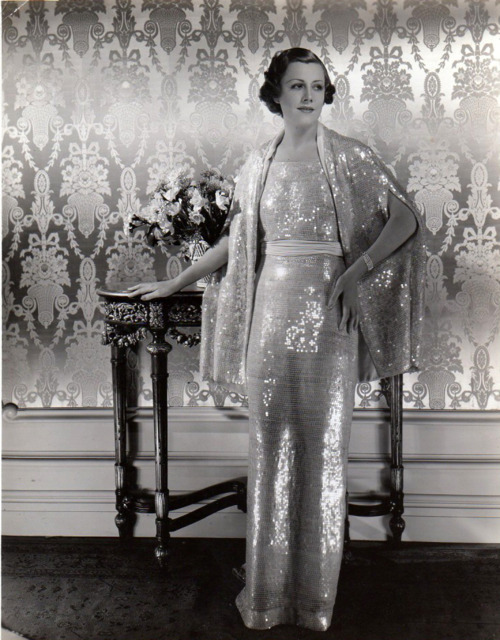 Irene Dunne circa 1936 pic from fanpix.net. Not buying any perfume till I find my perfect orange blossom (was just in southwest Turkey where orange trees we’re blossoming and wow, was just soooo intoxicating). But that bottle is really really pretty. And I agree! M.Micallef really knows how to make bottles that you’d want to leave out on a dresser. I tried a spritz of Robert Piguet Mademoiselle and loved it – lasted till the next day, then got a sample that lasted about one hour….. The orange blossom in that was so so beautiful. Will try the Yves Rocher, 24 was very nice but got kind of dry – had a decant last year. It’s tough trying to find a scent that captures a place! I still haven’t tried that one! I agree about 24. It’s more like a perfume-perfume instead of a perfume that smells like a place. The YR is cheap but it smells joyous. It doesn’t last long but I don’t get upset about it since the bottles are usually very cheap (they run sales all the time – I don’t think I’ve ever paid full-price for any of their stuff). In the meantime, I’m still on a search. Let us know if you try the Piguet – I’m wondering if the sample bottle had gotten more concentrated over time??? But since it is company that makes Fracas and Bandit probably the decant I ordered was bad. And there were so many fragrances I noticed this time. Lots and lots of hyacinths in Istanbul – really gorgeous – and the shishas reminded me of incense. But the orange blossoms, wow. It’s possible…even decants can evaporate some and that can make stuff seem “unbalanced”. Or not. It’s really hard to know sometimes! I think I can find the Piguet in-person to try. I need to find a stockist. My complaint with all the perfumes that have tried to replicate Istanbul is that all of them have been off to me. They concentrate on the spices, tea and maybe throw in a rose. Ultimately, they always smell like amber. That’s not my experience with Istanbul or any of the surrounding areas! I always remember the flowers (so many flowers!). Then it changes, but overall there’s themes of sea air and oddly enough, mothballs (which could easily be translated as tuberose in a perfume). Some neighborhoods are more like grilled meats, others have that sweet shisha. In summer, there’s juicy, ripe mulberries that smell like musk. But, overall, I feel like the perfumes I’ve tried as Istanbul as the inspiration have overlooked the vegetation. That’s such a shame! Next Post The Lipstick League – Week of 4.2.18 – What’s in Your Purse?